One of the most interesting functions featured by a lot of smartwatches is the ability to make contactless payments, using NFC. Still, starting with 2016, you will be able to make this with a regular Swatch watch. According to ZDNet, the first Swatch watch to have this function will be called Bellamy and it will basically be a traditional timepiece compatible with digital point-of-sale-terminals, similar to Apple and Android Pay. For the moment, the company hasn’t revealed that much details on how the watch will work, but they did announced a partnership with Visa, so you will be able to link your card with the watch. Also, it will have an NFC chip hidden under the hood, that won’t affect the functionality or the battery life of this basic Quartz watch. Moving on, the NFC-enabled Swatch watch doesn’t feature any wireless connectivity, like Bluetooth of Wi-Fi, so this means that it’s also not working together with a mobile app, like smartwatches do. Considering this, users will probably question the security level of this timepiece. In this case, Swatch has the answer: It’s linked with a Visa card and it works like a prepaid bankcard, so users can pay with it using contactless POS terminals. Therefore, it may not work with a credit card, but it has no issues in working with Visa prepaid or debit cards. To sum up, the whole purpose behind this NFC Swatch watch is to make people leave their wallets at home when shopping. Also, maybe Swatch is the first brand to release such product and other traditional watchmakers will follow their example. 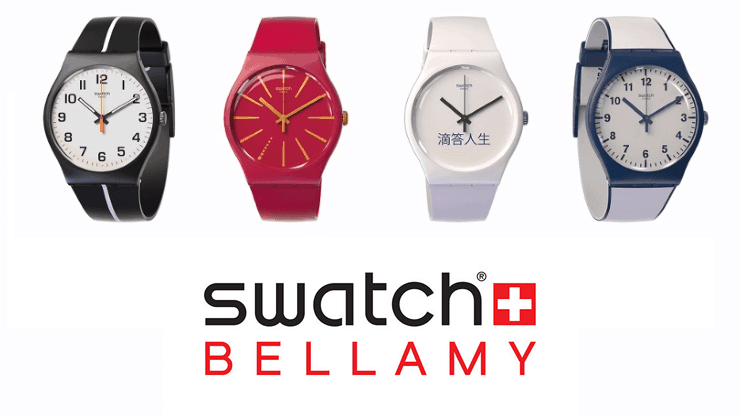 The price for the Swatch Bellamy wasn’t announced yet and when it comes to availability, it will first hit the markets from U.S., Switzerland and Brazil, while a version for China was already launched last month. A massive tech enthusiast who tries to keep with the latest releases, in particular Android and Nexus related news. Give him chocolate or a pack of oreos and he will talk for hours about cellphones and tablets!